April is Fanworks Month, where we take a break from the show for a few weeks and celebrate the creativity of the brony community by examining fanworks with the same seriousness and critical eye as regular episodes. This week is the webcomic Friendship Is Dragons by Newbiespud. Twilight Sparkle is totally min-maxing. It’s every Tuesday, Thursday, and Saturday for the past year and a half, so forgive me if I don’t try to list the news and so forth for that entire period. One of the great pleasures of living at the dawn of a new medium is watching new genres form with far greater rapidity than is usually the case. Probably the last time this was possible was a century ago, when first film and then radio emerged and discovered new storytelling possibilities. (Television doesn’t count. As a rule it just applied or occasionally combined the genres already established by film and radio. It’s fascinating to watch when some novel new way to use the Internet to tell stories catches on. Imitators crop up, doing the same thing but with a twist, until there are enough of them to be considered a genre. The shared elements between these imitators (most, but not all, of which are usually traceable to the original work) become the defining traits of the genre. Then as some of the imitators become popular, imitators-of-imitators pile twists on top of twists, and slowly subgenres begin to differentiate themselves. The process isn’t always so clean, of course. Often multiple sources end up, independently, doing something just similar enough that their imitators blend into a single genre. Even so, we can regard the process of genre formation as arising from the imitation of elements of a source work, which is another way of saying that genres grow from fanfiction. Not, generally, in the literal sense. None of the explosion of Tolkienesque heroic fantasy novels that appeared in the latter half of the twentieth century are Tolkien fanfiction in the sense of being set in Middle-Earth or starring Tolkien’s characters. However, they share with fanfiction that their authors found something appealing in Tolkien, and set out to do their own version of it. So it was with Shamus Young’s DM of the Rings, a webcomic assembled by combing through Peter Jackson’s The Lord of the Rings movies for screenshots and putting funny speech bubbles in the characters’ mouths. Nothing particularly new or fresh there–screencap comics date back at least to the 1960s. What Young added, however, was a fresh new central premise: His comic was not a straightforward retelling or even parody of The Lord of the Rings, but a reimagining. What if The Lord of the Rings never existed as a book or movie series, and instead were the creation of a group of tabletop fantasy roleplayers? The result is a very funny comic that refreshes the (by now rather tired) story of The Lord of the Rings by putting in a new level of drama. Instead of being the story of a group of adventurers struggling against the tyranny of a vast evil, it becomes the story of a group of players struggling against the tyranny of an overbearing game master, who is desperately trying to engage them with a boring and over-linear story about a group of adventurers struggling against the tyranny of a vast evil. Its first imitator, Darths and Droids, takes the conceit to a new level. In this setting, it is Star Wars, not The Lord of the Rings, that never existed and is instead created by a group of gamers, and rather than one campaign we have six in sequence with time-skips between them (currently the comic is nearing the end of the fourth, which uses screencaps from the original Star Wars movie). Notably, in Darths and Droids the players are engaged to a far greater degree, and rather than a tyrant, the game master is at times a pushover. This allows more exploration of the interaction between the two layers of story, the reimagining of Star Wars on one level and the lives and antics of the players on another. Along with the fact that the players sometimes change their characters (indeed, given that a major character dies in almost every Star Wars movie, guessing who the doomed character’s player will be in the next movie is something of a game among the comic’s readers), this allows the players to develop strong personalities of their own distinct from their characters. Where DM of the Rings explicitly parallels the drama around the table with the drama within the game, Darths and Droids takes a more complex approach. In the former the game master and players are parallels to Sauron and the Fellowship, so the defeat of Sauron allows the players to escape the DM’s tyranny as well; in the latter, the relationship between Annie and Jim influences and is influenced by the relationship between Anakin and Padme, but the more-or-less positive resolution of the former enables the latter to end in tragedy. As a general rule, campaign comics (as the genre is usually called) imitate Darths and Droids more than DM of the Rings, in that the focus is as much or more on the players (whose dialogue comes out of the mouths of their characters, with no clear markers to distinguish it from in-character dialogue) as on the characters and story within the game, even while the images of the comic depict always and only the game. Friendship Is Dragons is no different, and at least initially appears to be a bog-standard application of the genres’ tropes to Friendship Is Magic. However, as it unfolds it manages to expertly accomplish what neither “Double Rainboom” nor Time Lords and Terror ultimately did, which is to use its position as an instance of both Friendship Is Magic and Something Else to comment intelligently on both. Reflecting the episodic nature of Friendship Is Magic, each of the three complete arcs of Friendship Is Dragons corresponds both to a single play session and a story from the first season of the show. Occasionally an image is pulled from a different episode or even a different season, but the overwhelming majority of the images for each arc are pulled strictly from the associated story. The episode sequence is not adhered to, however; the first arc does correspond to “Mare in the Moon”/“The Elements of Harmony,” but the second is “Dragonshy” and the third is “Bridle Gossip.” The fourth and current arc then breaks with this structure, but more on that later. Unlike most campaign comics, which either avoid mentioning specific elements of gameplay or intentionally blend gameplay from multiple systems, the characters of Friendship Is Dragons are explicitly playing Dungeons and Dragons Fourth Edition. This is appropriate in a variety of ways, not least because of the obvious implication that the three previous generations of pony cartoon could have corresponded to the three previous editions of D&D (right down to there being a 3.5 edition). Admittedly, the players don’t seem to be aware of any prior pony games, but then the players (the DM included) come across as being quite young, and so it’s entirely possible that they had predecessors of which they are unaware. The fact that they’re playing a specific, commercial game is also apropos, given that Friendship Is Magic originated as a marketing strategy–doubly so, since that Hasbro owns both My Little Pony and D&D. There’s a deeper resonance, too, in that Friendship Is Magic has managed, despite being a commercial product, to serve as a seed around which strong communities of young people organize themselves. This is a pretty good description of roleplaying games as a phenomenon, too. The final, and perhaps most important, level of resonance here lies in the origin and nature of roleplaying games in general, and D&D in specific. The original D&D has three clear antecedents, two of which are readily recognized by gamers: tabletop war games (of which Warhammer 40K is probably the best known modern instance) and Tolkienesque fantasy. In this view, D&D can be seen as an attempt to adapt mechanics from tabletop war games to allow players to take up the roles of individual adventurers on a fantasy quest. However, this origin story misses both a major antecedent of D&D and one of its major functions, one important enough that it named the genre: roleplaying. Prior to the introduction of D&D (and to this day among non-geeks), the word “roleplaying” refers to something very different: a technique in psychological therapy where patients take on the roles of other people and act out how they believe they would behave in a particular scenario. The “play” in “roleplay” refers not to a game but to acting, a sort of improvisational theater designed to help people learn to better relate to others. Roleplaying games, in other words, partially originate from a tool designed to teach friendship lessons. It should come as no surprise, then, that much of the story of Friendship Is Dragons involves the characters, especially the DM, learning to relate to one another through the medium of the game. The first arc plays out extremely similarly to the episode it’s based on, primarily serving to introduce the players and their characters, who all resemble the Mane Six without quite being them. Notably, the players themselves have no names, and other than being referred to as “she” by other players from time to time, are characterized entirely by implication. Where the players of Darths and Droids regularly talk about their personal lives at the table (so that, for instance, we know quite a bit about Ben’s troubled relationship with his father), the Friendship Is Dragons players are more recalcitrant, and therefore a little more anonymous. At the same time, we come to understand them and the interrelationships between them fairly well through their play styles. The title of Friendship Is Dragons is literal: the friendship of the characters is defined by their game. Twilight Sparkle is a new player who has fairly extensive knowledge of the rules (and of the clichés and tropes of genre fiction) but no ability to apply them to actual games or experience of the culture of gaming. Applejack, by contrast, is an experienced gamer who seems to prefer to stand slightly outside the action, commenting on the goings-on while rarely actively participating. Rainbow Dash, probably the funniest character in the strip, is a proponent of the kick-in-the-door style of play, endlessly frustrated by the lack of opportunities to massacre monsters and loot their corpses. Rarity, in a brilliant twist on her complex and dual nature in the show, seems primarily motivated by opportunities to play a character, in her case a grasping, greedy rogue pretending to be an upstanding citizen and fashion designer. Fluttershy is another new player, who seems to be both shy by nature and intimidated by her lack of familiarity with the game. Finally, Pinkie Pie is essentially the same character as in the show, and an archetype familiar to most players of tabletop games: the player who takes the unreality of the world and lack of meaningful consequences as license to play a completely ludicrous character. The climax of the first arc is where things start getting really clever. As I’ve mentioned in a few of my essays on the first season, the show implied by the Friendship Is Magic premiere is not the show that we actually got. Friendship Is Dragons plays with this by making the conclusion of the arc largely an accident. The DM’s plan had been that, following their crushing defeat in the ruined castle by Nightmare Moon, the players would have traveled Equestria for many game sessions, questing for the essences of the destroyed Elements of Harmony, before finally returning to confront Nightmare Moon and defeat her using them. 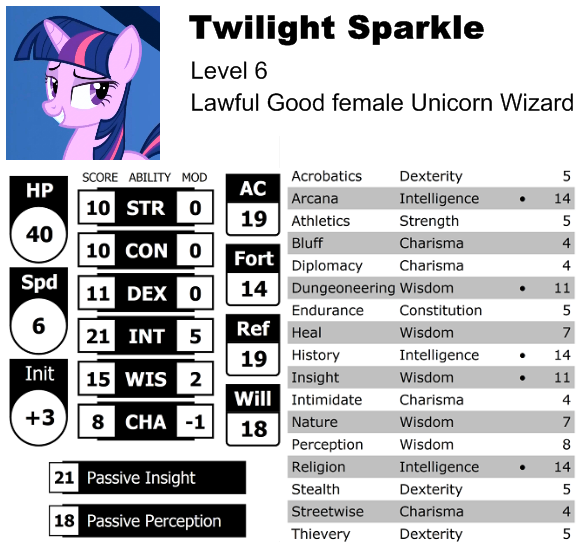 Unfortunately for the DM, Twilight Sparkle completely derails these plans by (extremely persuasively) explaining how each of her companions maps to one of the Elements of Harmony and then, out of the blue, correctly guessing that the missing sixth element is magic and therefore maps to her. Much as Hasbro’s insistence on a more episodic, slice-of-life show both derailed the initial plans and, after an extended adjustment period, ultimately resulted in much stronger television, this derailment of the DM’s campaign initially leaves them unable to adjust and threatening to end the campaign. At the insistence of the other players, however, the DM agrees to try to continue the game. The result is the second arc, based on “Dragonshy.” Again this is an inspired choice, as “Dragonshy” is pretty clearly one of the few remaining remnants of the original conception of the show. Its “ponies do Buffy” approach fits neatly into the magical girl genre that contains both the show implied by the Friendship Is Magic premier and Buffy the Vampire Slayer, and the players in the Friendship Is Dragons version point out several other similarities, most notably the similarity of “a hundred years of blackened skies” to “a thousand years of night.” In the comic, in other words, the DM is recycling elements of his abandoned plans, just as the original “Dragonshy” recycled elements of the abandoned show premise. Also like “Dragonshy,” despite ostensibly being an ensemble piece, the second arc is Fluttershy’s story. The lesson she learns is an interesting variation on the episode; where in the original she learns that she possesses inner strengths that are valuable, in the comic she learns the power of masks. This is one of the great strengths of roleplaying: by pretending to be someone else, and acting out the strengths of that other person, it is possible to discover previously untapped strength in oneself. Fluttershy’s stats indicate that she is capable of being very intimidating when she chooses to be, and by playing it out the player is able to discover she can, too. The third arc is probably the weakest of the comic’s run thus far, unsurprising given that it’s based on one of the weakest episodes of the first season, “Bridle Gossip.” It plays with both the clichéd “racism is bad” plot of the episode and Zecora’s shallow, tokenistic characterization by making it all a shell game on the part of the DM: they know some of the players will recognize the clichéd plot, while others will assume the rumors about Zecora are true, and relies on that to artificially create conflict within the party. Zecora, meanwhile, turns out to be a different cliché entirely, the obsessed and unscrupulous mad scientist, whose rhyming speech is a cruel curse imposed by mocking magical plantlife. It’s a fairly clever twist on the episode, but unfortunately the arc bogs down badly in interminable arguments between the players over whether or not Zecora is “evil.” This is somewhat the point, to teach the DM a lesson about manipulating and deceiving the players, but the reader suffers from it nearly as much as the DM. The fourth and current arc is the most interesting thus far. It starts out rather similar to previous arcs, more-or-less following the plot of “Swarm of the Century,” but with the players immediately recognizing the danger posed by the parasprites. It then takes a turn for the weird when Twilight Sparkle again derails the plot by killing all the parasprites in a single round, forcing the DM to improvise the rest of the session. This is another brilliant reference to the role of the original episode in the development of the show, as “Swarm of the Century” forced a period of intense experimentation that required a complete alchemical transformation to resolve, and to some extent wasn’t fully resolved until a few episodes into the second season. In the comic, the resulting arc turns from interrogating Friendship Is Magic to interrogating the structure of the campaign comic by violating one of the fundamental generic conventions originated by DM of the Rings. Namely, just as DM of the Rings follows the overall plot and structure of The Lord of the Rings, most campaign comics follow the structure of the work they’re taking screencaps from. They may skip scenes or episodes, or (as Darths and Droids does) insert footage from deleted scenes or DVD extras, but so far as I know Friendship Is Dragons is unique in the approach it’s taking in its current arc of blending together episodes. Specifically, after the aborted “Swarm of the Century” story, the arc continues with a hybrid of elements from both “A Bird in the Hoof” and “Dog and Pony Show,” with some reason to believe (though it has not occurred at the time of writing this essay) that “Fall Weather Friends” will be included as well. This works on one level as a solution to the problem of what to do about the relative paucity of Friendship Is Magic episodes that involve all of the Mane Six. More importantly, it also throws the reader out of the usual comfort zone of campaign comics. One of the common elements of campaign comics, going back to DM of the Rings, is that the reader is generally assumed to be familiar with the original work and therefore to have an idea of where the story is going. To use the example of Darths and Droids, while the reader may not know the details of how any particular scene is going to play out, they do know that the A New Hope arc will start on Tatooine, continue to the Death Star and meeting Princess Leia, and conclude with the trench run and destruction of the Death Star. This is why Darths and Droids’ innovation of having the player- and game-level stories influence, rather than mirror, one another was important, because it allows the existence of a storyline that isn’t entirely predictable. Friendship Is Dragons’ current arc takes that a step further. We no longer have any idea how the current game session will go, because we’re in uncharted territory. We know that elements of “Bird in the Hoof” and “Dog and Pony Show” are in play, but because they are mixed we have no idea which elements will appear, or if they will appear in the same order as in the episode, or whether they will continue as separate threads or influence one another. In short, rather like Friendship Is Magic, Friendship Is Dragons has found a way to transcend the limitations of its genre and try something new, while still remaining true to both its generic roots and the original works from which it’s derived. It’s an impressive piece of work, and deserves far more attention than it has received. Next week: Fanworks Month draws to its conclusion with evil cultists, secret robots, and incredibly catchy songs. When I first started watching MLP, it took a long time to move from thinking “this show is cool!” to actually thinking about WHY the show is good. I've been reading Friendship is Dragons since it began, and never stopped to really think about it beyond “hey, it's pretty entertaining”. Until I read this article, of course. Now I have to go back and re-read it all with a new perspective. Definitely the same for me. I decided to write about FiD because I like it. It's only after I made that decision and started reading it with my analysis hat on that I realized why it's good. I was actually surprised that I found this much in it! yeah I'm very new to the show and only started watching it a week ago but now that I'm righting a review I have realized how much work was done in in the making of the show hopefully Ill finish my review soon and give it praise. Well, I'm glad you like the comic enough to devote a week's worth of literary over-analysis to it. That's the kind of compliment that gets me through the day. But I'm honestly very surprised at the kinds of themes and subversions you've dug out of this, because almost 100% of them were in no way intentional. I caught on to “4th-gen MLP = 4th-ed D&D” very early in the comic's run, but only because it was pointed out several times in the comments. Nor was I expecting it to be a big deal (you're not the first person to comment on this) that I use an explicit set of official rules as opposed to most campaign comics. I just used 4th edition D&D because that's what I was familiar with, and I didn't want to go to the trouble of trying to hide it like DMotR and Darths. The resonance is more serendipity than intent. Many of the allusions and parallels in my comic to the development of the show are happy coincidences. I'm just not the kind of person who likes to dig for show production trivia. I WAS aware of the “less adventure, more slice-of-life” discussion behind the scenes, because that's pretty much common knowledge, and maybe that had some kind of subtle influence on the end of the first arc. Anything after that, especially the Swarm of the Century “alchemy,” is more blind serendipity. You might call it brilliant, I call it sheer luck. And then at the closing, the interrogation of the “genre” of campaign screencap comics, and how the current arc's new direction is breaking conventions… Maybe that's accurate, but I wouldn't go so far as to say it's an intentional challenge of the medium. The decision was more born out of a desire to surprise the readership and make them laugh, because that's what I thought would be funniest at the time of writing. I make up a lot of this as I go along. If it turns out good, I'm just as surprised as anyone else. The reason I'm being so frank, sharing all these behind-the-scenes creator details with you, is because I want to ask you a question. When you do this kind of over-analysis, how much of the “brilliance” you find do you actually attribute to the writer? On what level do you think your insights are accurate to the creator's intent – do you at least assume that, in some form or another, the thought passed through the creator's mind? Or are you incredibly self-aware about it, and assume that your insights could very well be a shot in the dark? I don't mean to be hard on you with this kind of questioning. Not a few years ago, I was running a blog doing the exact same kind of over-analysis. I'm just curious, because I never had the opportunity to pick the creator's brain, and I kind of want to see your reaction. No, that's fine! It's an interesting question, actually, and one I've thought about before. I guess my answer would involve an analogy to tools. A tool, let's say a screwdriver, is created with a particular purpose and used for a particular purpose, but there's no reason they have to be the same thing. You, the screwdriver manufacturer, may have intended for it to be used to drive standard-head screws, and the fact that I'm using it on Philips-head screws is not part of your intention. At the same time, from my perspective I'm intending to use it for driving Philips-head screws, so it's completely in line with my intentions. Purpose, in other words, is subjective. At the same time, there's an objective sense in which a screwdriver is good for some things and not others. I can use it to drive nails, but it's going to be harder and less efficient than with a hammer. Function, in other words, is objective. A toolmaker usually has specific intended functions as part of their purpose, of course. But a tool can have functions which were not part of its creator's purpose. For example, the Internet had two purposes intended by its creators: to allow academics to share information easily and, in the event of the nuclear destruction of the majority of American cities, to allow military and government officials in the surviving cities to communicate with one another. But it turns out to also function really well as a medium for community-building, which wasn't in the minds of its creators at all. So, my answer to your question would be that your purpose in creating the work may not have been to create an interrogation of the campaign comic genre, but the current arc functions well as one. Which is why, you may note, throughout the essay I say that “the comic” interrogates this or challenges that–precisely because I'm not presuming to read your mind, just going by the things I see the comic doing. Put another way, while I'm interested in hearing creators talk about what they were thinking or intending when they made something, I don't think it really impacts what I'm doing here, because I'm not trying to read creators' minds. I'm trying to write about how works function, not what their creators' purposes were. As for how much of the brilliance or quality I attribute to the creator: All of it. Whether it was part of the intended purpose or not, the creator made something that has this cool function. If it was intentional, then they deserve full credit for putting it in. If it was unintentional, then they deserve full credit for creating something of sufficient quality and flexibility that I was able to find this function in it. I think this comment reflects the author's personal preference of RPG system more than Friendship is Magic's actual resemblance. To answer your question, Froborr: Very. Rereading the analysis again, I notice how you specifically use “the comic,” talking about what IT accomplished. Don't worry, your answer makes sense. Very interesting, Froborr. Thanks for satisfying my curiosity, and, again, thanks for the awesome analysis. WHat's your opinion of the 'community' of sorts that's developed regarding the regular commenters on the comic? I quite like it. I don't comment very often, but I nearly always make a point of reading the comments, especially the RP stories. I've been a reader of the comic since the first arc, I have also been an avid reader of the comic's comment section. For me that's where half the fun is, and where people toss around ideas and share experiences that I think help lead the comic in one direction or another almost as an actual game group would lead a game. Also Raxon is fun, Sometime I'll have to start commenting too. I strongly suspect 'Story Time' is responsible for it. As in, with a lot of people sharing info on their lives, even if just gaming, you kinda have to end up with either people being chased away by trolls who take advantage of the 'vulnerability', or a community being built. In some ways, giving up information about yourself is a matter of trust, hence people freaking out over giving their address and such to shops – they DON'T trust them – and when a lot of people trust each other, that's what we usually call a community. That's an excellent observation, Aerion. I think there's a lot of truth to it. And I will say Story Time is what keeps me reading the comments. I dunno about the comments guiding the comic, you'd have to ask Newbiespud about that, but I definitely agree they add to the experience of reading the comic. Newbiespud, you should give yourself a little more credit than that. You set out to “surprise and entertain” your audience, and chose a direction towards that goal based on what you already know they will expect. Later, someone claims that you wrote something that challenged and toyed with the constraints of your genre. That sounds less like coincidence and more like two different names for the same thing. You just did it without already knowing the fancy literary vocabulary for it. The adventure vs slice of life thing, though, sounds more like a natural consequence of having a source material which started with one tone and then progressed towards another. Of course you'd run out of story pretty quick unless the campaign did the same thing. No piercing commentary to be found here. It's very blatantly 4E that they are using. Mechanics, alignment, character sheets, action points, any denial that it's 4E is just prejudice on the part of the reader. 4E gets a lot of hate and I know a lot of people who refuse to allow for anything good to come from it. Pathfinder, while a great system, is not what is present in FiD.